If the heating element of your oven is not heating the oven properly, or working at all, then a faulty oven element might be the reason. The fan oven element is the part that is responsible for heating the oven. 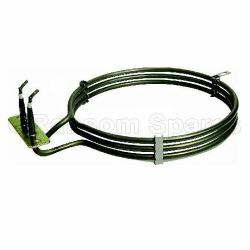 The compatible fan oven element provided by Ransom Spares is the perfect replacement for your oven’s non-functional element. Just a simple installation will bring your oven back to life and let you cook your favourite meals easily. This circular element has 3 turns for quick and efficient heating. This fan oven element is compatible with select models of Baumatic, Zanker, Whirlpool, Zanussi, etc. This quality genuine replacement fan oven element fits select models of Alno, Elektro Helios, Moffat, Zanker, Zanussi. Genuine Rangemaster 110 Fan Oven Element - Also fits select models of Leisure cookers. Baumatic oven element. Circular in shape with 3 turns it sits inside your oven at the rear and is responsible for the heat that is produced inside your oven. If this part fails then your oven will not heat up and will need replacing. The element arrived very promptly, was great value and has worked perfectly so far. Delighted to finally have a working oven again! Item exactly as described and a perfect fit replacement for the broken element. Easy to fit in a few minutes, and does exactly what it should. Fantastic price, and saved a 'new oven conversation' instantly. arrived almost on time, but product was perfect for our needs, we would definitely use you again for any spares. A fab service which exceeded expectations. Just before Xmas so disaster avoided. I bought the wrong size so fittigwas trickier than expected but fully my fault. Easy to fit for a rank amateur. Saved money on an expensive call out. Quick delivery meant roast not toast for Sunday lunch. Great Find, excellent product and easy to fit. Ransom came up trumps on all fronts. First with a video explaining what could have happened with my oven and how to fix it with easy to follow instruction. Then a great price on the product required with next day delivery. Saved me a fortune on having to use a domestic appliance engineer, especially as it was such a simple fix. Thank you, highly recommended and no hesitation in using again. Excellent value replacement element, very easy to fit. Delivered promptly, recommended. Replacement oven element was easily found on the web site and was the most competitive price I could find on the web, the part arrived next day and was fitted within 15 minutes. Perfect result. Hi John, this element is listed as 2500w.